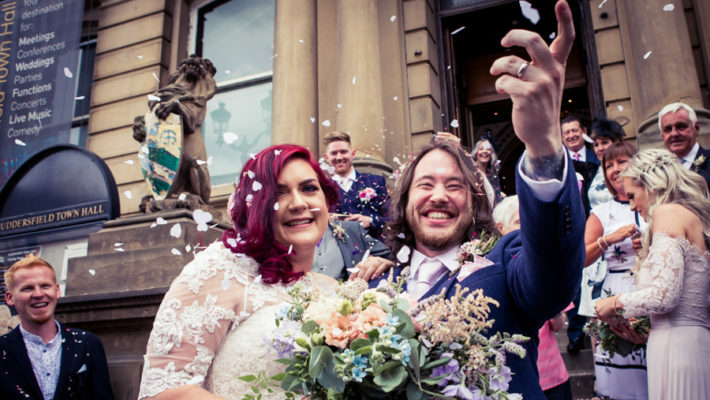 There’s so much to this wedding that makes me smile: the gorgeous images and Sarah’s beautiful smile – the portrait photos of today’s lovely couple are just wonderful. Then there’s the vintage medical theme, which is genius! Stuart and Sarah had vintage medical equipment (yes! ), those lovely bottles and also lots of books… and who wouldn’t enjoy sitting down at a wedding reception and dipping into 1950s books about anatomy for nurses?! Brilliant! All the images are by Dave at Just Hitched wedding photography. He captures details and emotions so well, and I know you’ll love this wedding. Absolutely! We loved how relaxed he was. He fit right in on the day to the point where we hardly even noticed him working and his photographs were absolutely stunning. He captured our day so well and has given us a fantastic collection of memories that we’ll treasure forever. He’s become a good friend as well and has been a brilliant mentor for me and my own little wedding photography business. Marks Hall Gardens and Arboretum, Coggeshall, Essex. A totally relaxed, casual day that left us with the biggest smiles on our faces. We were completely blown away. Every image captured our day perfectly and exactly how we remembered it. Relaxed, English garden style with a vintage medical theme. Hahaha, yes! I’d held it together right up until I was about to walk down the aisle and then the happy tears came! Stuart and I both work for the Ambulance Service. At the time, I worked in the Dispatch Centre, dispatching ambulances to emergency calls and he was an Ambulance Technician. He heard my voice over the radio and thought I sounded nice (surprising, I hate my radio voice!!). We were introduced through friends and became friends for about a year before we eventually got together. Go hand made and seek out your friend’s talents! Turns out I have friends who make jewellery, do make-up, make table plans and name tags and I’m a pretty dab hand at making brooch bouquets! We had Save the Dates designed by a friend who was just starting a little design business so she did ours free of charge as long as we displayed her logo. I had a strong idea for invitations in mind and, when I couldn’t find what I wanted online, I designed them myself in Photoshop and had them printed with Vistaprint. They were brilliant and a real talking point with our guests. On the day stationery was created by a friend of mine, she did our table plan cards, name cards and little tags for our favours. And I hand made the table names and menus. Oh definitely. It was a design from a gorgeous vintage dress I found on Pinterest. Long and flowing with a kimono style sleeve and a deep v neck. My dress was made by a local dressmaker in the end, called Helen (http://www.theoriginaldressmaker.com/OriginalDressmaker/Welcome.html). I’d tried several dresses at bridal boutiques but hadn’t really found anything I’d fallen in love with and the prices were so far out of my league I knew I’d never be able to afford them anyway. Helen made the exact style dress I wanted at a fraction of the cost!! Jeans!! Although I did say they had to be decent jeans and not a £9 pair from Primark 😉 He also wore a checked Superdry shirt and a waistcoat, which was hired. The best men wore the same and the Dads went for full suits, also hired. My girls are all so different in style and personality so I knew I couldn’t put them in the exact same dresses. In the end I went with a 50’s style dress from Honeypie Boutique (http://www.honeypieboutique.co.uk). My sister, Hannah, and my friend, Lucy, wore halterneck styles in a deep purple and turquoise and Kelly had an Audrey Hepburn slash neck style in a royal blue. They all had ivory petticoats underneath. Each of them wore individual shoes – Hannah chose a pair from TUK with a gorgeous teal heel and peacock feather up the side of it, Lucy went with silver shoes and Kelly wore a pair that matched her dress perfectly. To tie them all in, they all had mini brooch bouquets, which I made, and a peacock feather clip in their hair. Hair was done by a friend that I work with who used to be a hairdresser. She did a fantastic job of working with my unruly mop! Make-up was also by another friend who has a small salon called Deelights (http://www.dee-lights.co.uk). Our flowers were absolutely stunning. They were created by Sarah Jones, a florist I found at a local wedding fair (http://www.sarahjonesfloraldesigns.co.uk). She really understood my vision and wasn’t put off when I suggested she design a bouquet around my brooch bouquets. She also loaned us lots of gorgeous vintage cut glass vases and it was her idea to go with the vintage medical theme so we bought lots of vintage medical bottles for her to fill with flowers and dress the tables with. I remember heading down towards the aisle and everyone looking up towards me. It was completely overwhelming and I almost burst into tears! I barely remember reciting our vows but I do remember exchanging the rings and my sister doing a beautiful reading for us. It passed by in a blur so I was pleased to have a video of it to look back at afterwards. My sister read a poem called I Carry Your Heart by e.e.cummings, one of my favourite poets. Our venue was a stunning flower garden which needed very little decoration as it was so beautiful already. We then had our reception in the neighbouring coach house. I didn’t want to overpower it with too much as it was such a pretty building already so we put up a little bunting and just decorated the chairs with lace bows. A mix of both. We had a three tier cake made for us by another work friend, Janne (https://www.facebook.com/regancakes). We had a fruit bottom layer laced with Jack Daniels for Stuart, and two sponge layers above that (one chocolate with Baileys cream and the other was a red velvet). I didn’t want plain white icing so Janne picked out the main colours from our day and iced them in purple, turquoise and blue and then dressed each layer differently. Our cake topper was from Etsy (https://www.etsy.com/shop/missnatch) and was a great representation of us in our ambulance uniforms, me with a camera around my neck and our little cat, Lewie, at our feet. We would have loved to have a band but just didn’t have the budget so we booked a DJ (another fellow ambulance person!) in the end. Ash did a fantastic job of keeping everyone entertained and I spent most of the evening dancing!! The best advice I can give to anyone is to relax. At the end of the day, the most important thing is the fact that you are getting married. If anything else goes wrong, then it really doesn’t matter!! Also, really make the most of the time the two of you get together with your wedding photographer. I loved that part of our day and the photographs of the two of us are amazing. Being able to call Stuart my husband. It’s the best feeling in the world! 12 of my Etsy wedding favourites! Oooh, lots and lots of lovely details, and what an unusual (and fab) theme!